Heeeeeeeeere’s a download of Variation of Cable Stitch! Click on the image to get to a pdf version of the pattern. The gauge seems a standard 8ply/DK yarn, which is what I used. To make the larger size with minor modifications, I needed 550g (approximately 1100 metres or 1200 yards) of yarn. For me, it was a pretty quick and easy knit; the only thing to watch out for is the neck, which I felt was a bit small (noting that my neck is neither swanlike nor graceful). This is my first attempt at posting a vintage pattern, so please let me know if it works OK (or doesn’t, as the case may be). After some very helpful advice from Bex and a couple of hilariously awkward phone calls to companies related to FW Hughes (the company that produced the pattern) I was able to establish that it was OK to post the pattern. The people I spoke to about reproducing the pattern were very nice and helpful, but I’ve never heard ‘sorry, you want to do what?’ so many times in my life. In the process of explaining who I was and what I wanted to do, I did find out some interesting tidbits about how Hughes had been bought out, and that the department that handled the knitting patterns was shut down in 1986. Although it was a bit sad to hear about its demise, it wasn’t altogether surprising given I was calling businesses that were in the wool industry, but no longer in the hand knitting industry. Hearing about how FW Hughes had been bought out and subsequently changed reminded me of Australian Country Spinners, and how it has evolved over the years. The recent Landline piece about ACS has been doing the rounds on the Australian Knitters board on Ravelry but if you haven’t checked it out, it’s well worth a look. Fingers crossed it’s not geoblocked outside of Australia. Spoiler alert: there is a minuscule glimpse at ACS’s pattern archive. I would pay good money to spend some quality time leafing through those patterns, no lie. Thanks so much for chasing this up and posting it! I really love that stitch pattern… And how brief the pattern is 😉 we do like to have things spelled out for us these days. 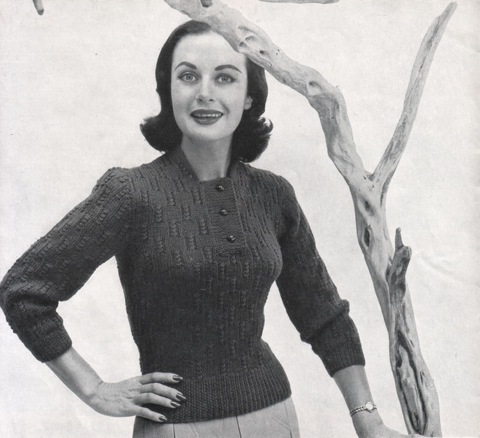 Oh, if only I had a figure to wear those designs but, alas, I’m not Sweater Girl. Love your story of how you got to publish your PDF!